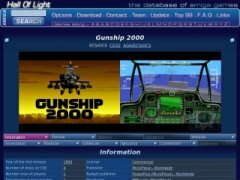 On the web page Hall of Light (HOL) you can find information about games for the Amiga. Information like: screen shots, hardware, programmer, musician, scans of the box and diskettes, publisher and more. You can't download games from this web page.